In 1962 Phnom Penh was a fine city known for wide boulevards, stately parks, the arts, and culture. The Cambodian city, located at the confluence of the Tonlé Sap and the Mekong Rivers, was expanding. To accommodate the growth, Chao Ponhea Yat High School was built on a tree-lined street in a quiet neighborhood filled with French architecture and small outdoor cafes. The school was a modern three-story concrete structure with wide balconies overlooking a large, shady courtyard, filled with flowering trees and a flagpole. 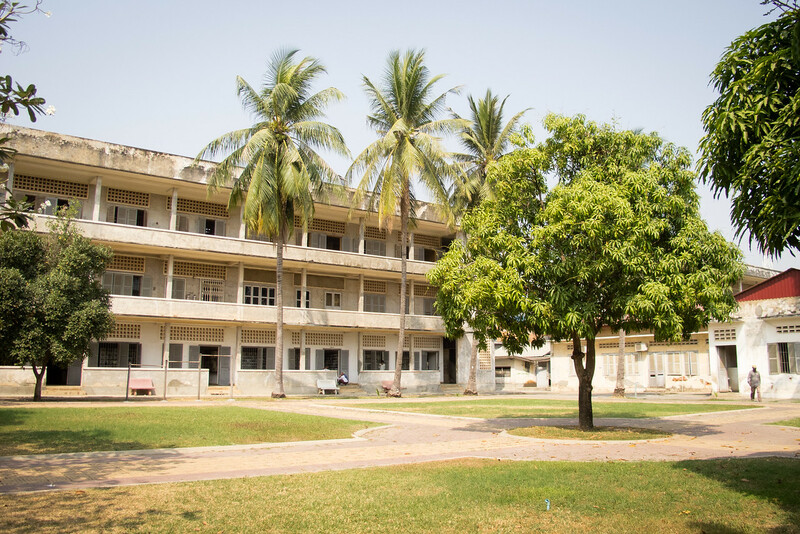 The classrooms had white ceilings, yellow plaster walls with green chalkboards and floors covered with yellow and white linoleum tiles laid out in a pleasing checkerboard pattern. It was a normal high school, like high schools everywhere, where kids studied, made friends, fell in love and aspired to make more of themselves. A little over a decade later things had drastically changed. After years of civil war, misplaced alliances and Richard Nixon’s illegal carpet bombing campaign the country was devastated. Phnom Penh’s citizens were out of supplies, demoralized and tired. The proud city that had once been known as “The Pearl of Asia” was in shambles and on April 17, 1975, the Khmer Rouge, with little resistance, marched into town. It was only a ragtag army comprised mostly of illiterate teenaged boys from the countryside, but circumstances and foreign imperialism enabled the seriously deluded Khmer Rouge to take the city. Their leader, Pol Pot, ordered Phnom Penh cleared of its people and declared it was no longer 1975 but “Year Zero” in Cambodia. In many ways, the country had been bombed back to the Stone Age. Under the new regime, all traditions were to be discarded. Cultural and artistic endeavors were to be destroyed and a new revolutionary culture was to replace it. Families were intentionally divided and the population, including children, the elderly, hospital patients and the infirmed, were forced into the countryside without provisions to fend for themselves. Many died. The educational system was abolished, and anyone deemed to be an intellectual, anyone who was educated, artistic or even demonstrated the capability of critical thinking was seen as an enemy. 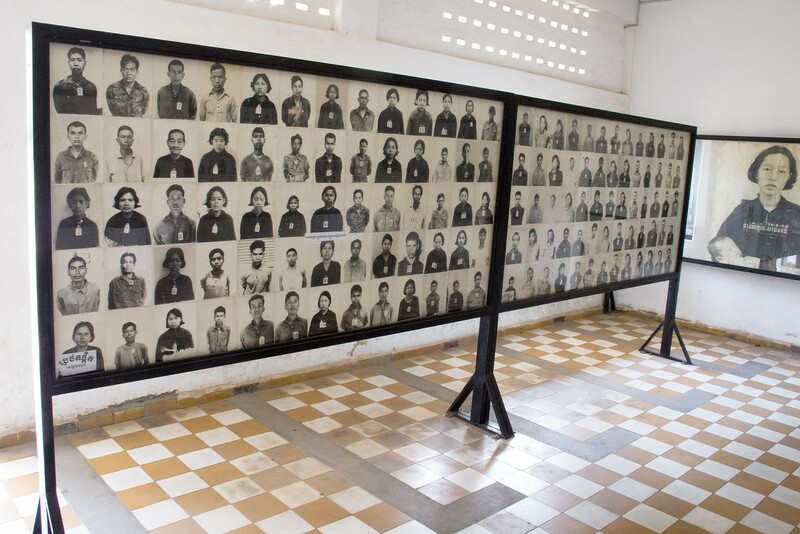 Chao Ponhea Yat High School was officially renamed Security Prison 21 (S-21), – nicknamed Tuol Sleng (which means “Hill of the Poisonous Trees”) – and turned into a torture center; one of over 150 spread throughout the country. The converted school held anywhere from 1,000 to 1,500 prisoners at a time. Prisoners were tortured and forced to sign “confessions,” often being coerced into naming family members and associates as accomplices. 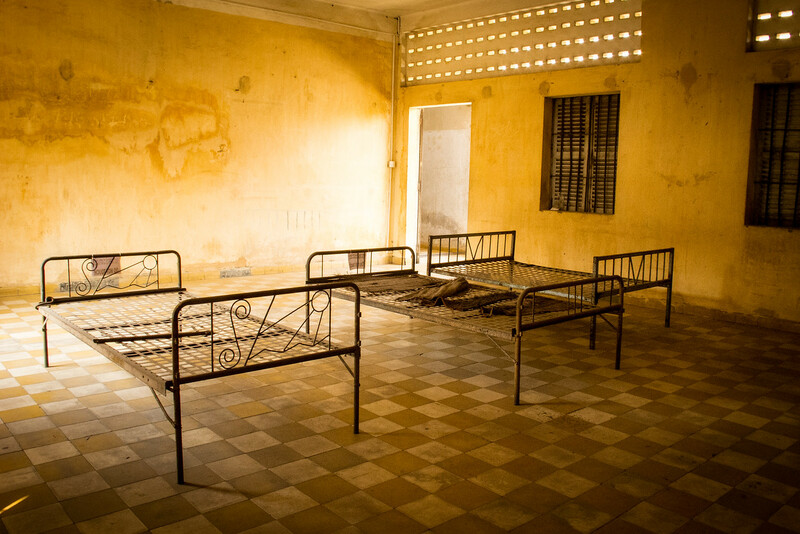 From 1975 to 1979, up to 20,000 people were processed at Tuol Sleng. Academics, doctors, government officials and teachers, as well as students, factory workers, monks, and engineers, were especially targeted to be sent to S21. 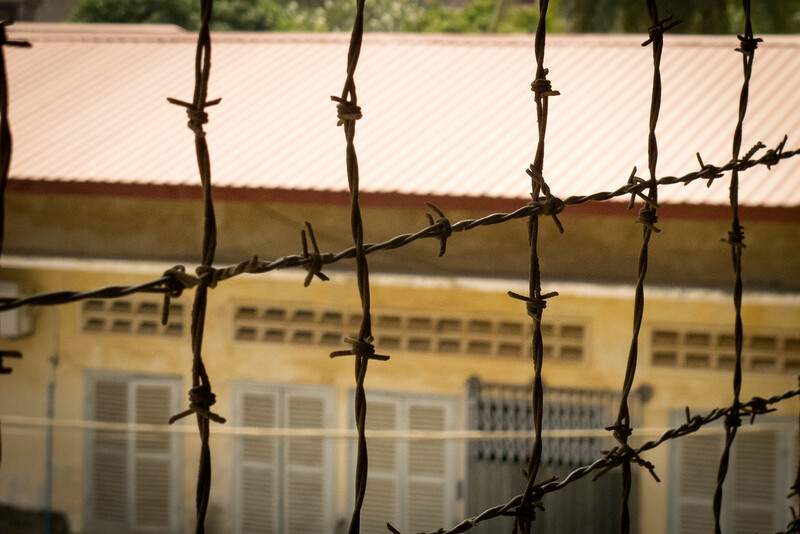 Khmer Rouge leadership boasted over the state-controlled radio, “To keep you is no benefit, to destroy you is no loss.” One of the last prisoners to die was twenty-nine-year-old American Michael Deeds. He was captured on November 24, 1978, while he and his friend Christopher E. DeLance were sailing from Singapore to Hawaii. After their “confessions” they were, like most other prisoners, blindfold, handcuffed from behind and placed in trucks to be taken to what they were told, was a “new home” thirty minutes out of town: The Killing Fields of Choeung Ek where they were executed with farm implements and thrown into mass graves. 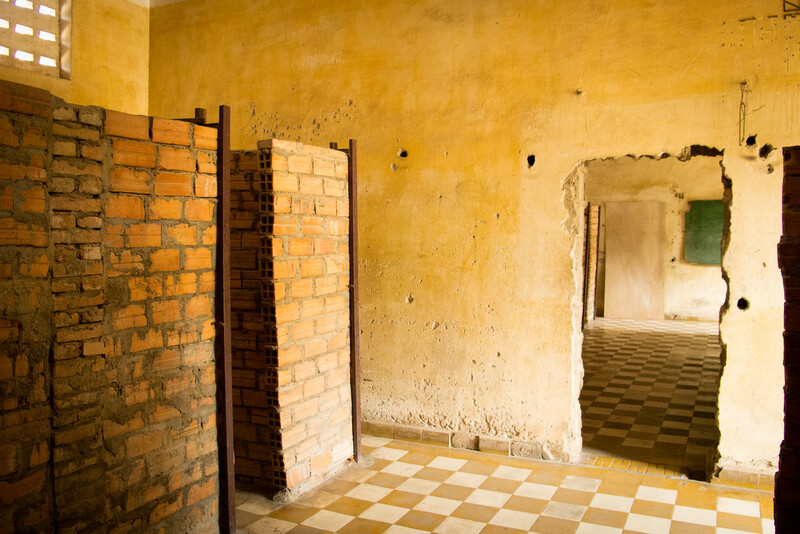 Chao Ponhea Yat High School, S21, Tuol Sleng has now been turned into a “Genocide Museum.” I walked around the grounds with watery eyes, a lump in my throat and an urge both to sob and vomit at the same time. That something this horrific took place in my lifetime I find deplorable. Some of the perpetrators complicit in this atrocity are still alive awaiting trial. Pol Pot, the fanatical communist, died a free man in 1998, in a compound near the Thai border where he had survived, inexplicably to me, with support from several administrations in the United States and others in the international community. On the surface, Phnom Penh is just now getting out from under the stench of that era. It is hard to recover when over half of your 7,000,000 person population perishes in less than a generation due to genocide, man-made famine, war, and mass murder. It reads like a horror story, and it is. Think about Cambodia next time you hear about intellectuals and education being derided, groups being scapegoated or opposition to the teaching of “critical thinking skills” in your own country. What happened in Cambodia may seem impossible but, it did happen. At a distance the former Chao Ponhea Yat High School in Phnom Penh, Cambodia looks pretty much like a typical high school anywhere in the developed world. Torture room where prisoners were strapped to their beds complete with some abandoned instruments of torture. 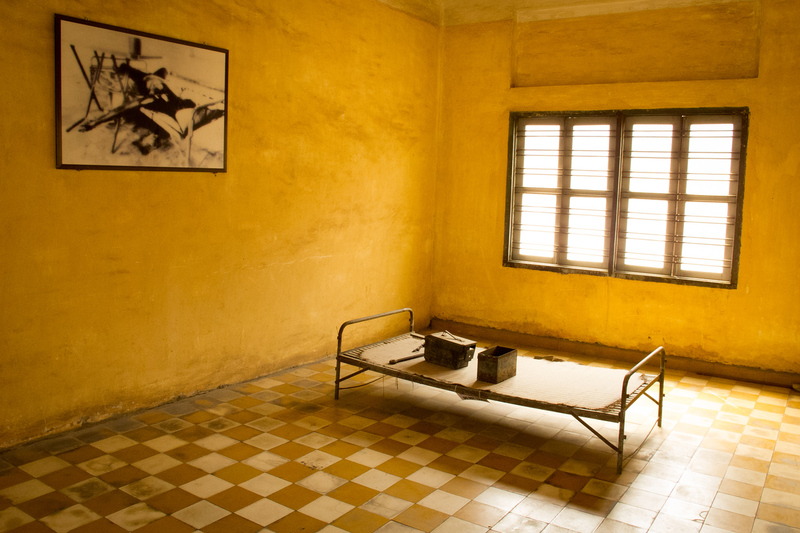 The photos on the wall are how the room looked, with prisoner strapped to the bed, when it was liberated in 1979. 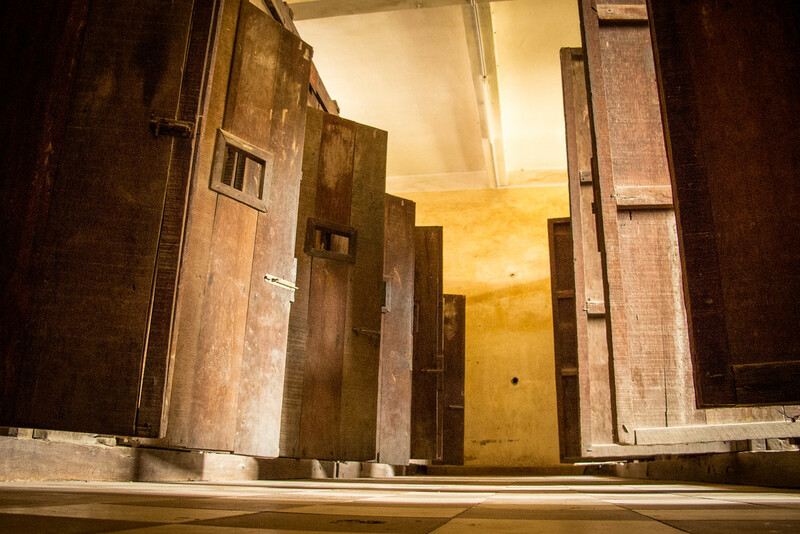 Some of the rooms contained multiple beds to which the prisoners were strapped while being tortured. The stains on the floor are from blood. Cells were constructed in classrooms. This room still contains the original chalkboard. Some of the tiny cells were constructed of brick and others constructed of wood. 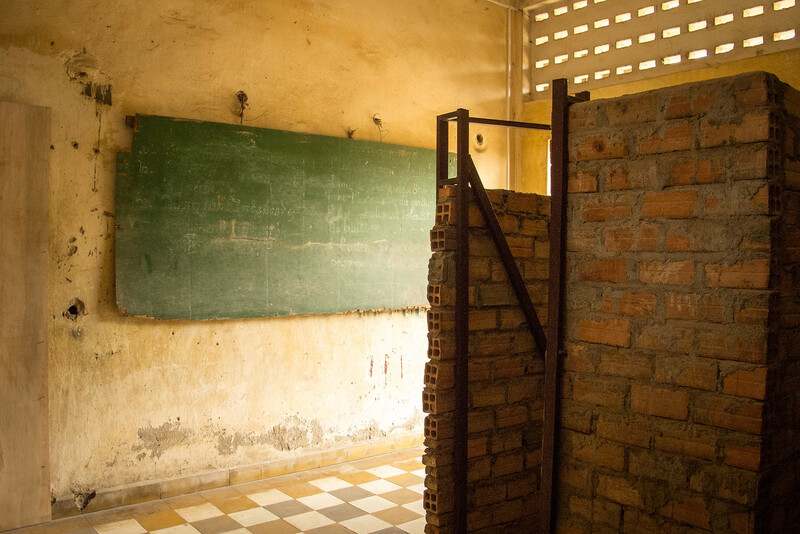 Wall were opened between classrooms so the guards could more conveniently handle the prisoners. Barbed wire was strung along balconies to prevent prisoners from committing suicide from jumping.